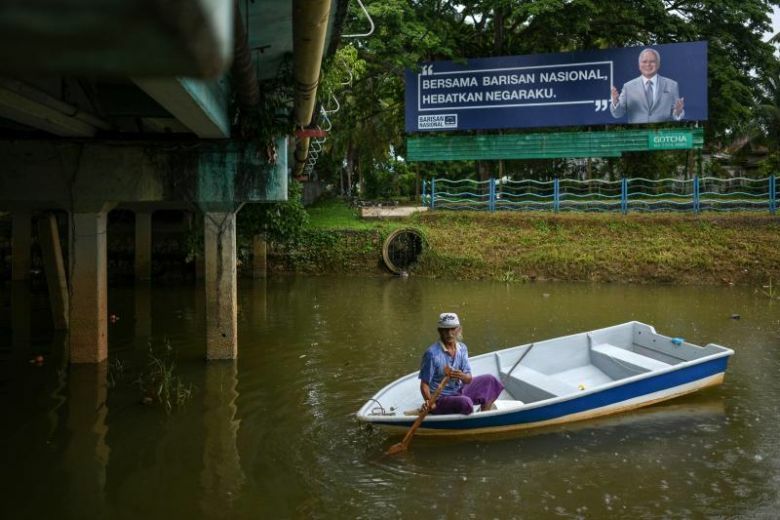 PETALING JAYA (THE STAR/ASIA NEWS NETWORK) - Ruling coalition Barisan Nasional will prevail in Malaysia's upcoming general election despite growing Malay sentiment against it, pollster Merdeka Center revealed in its latest survey. The survey showed that Malay sentiment against BN is likely to cause a 7.9 per cent swing in the May 9 polls. According to Mr Ibrahim, Malays make up 62 per cent of voters in Malaysia, with 117 of the country's 222 parliamentary seats having a majority of Malay voters. If BN hopes to maintain its status quo - it won 133 seats in the last election in 2013 - it will need to secure at least 95 seats in Peninsular Malaysia, said Mr Ibrahim. The Merdeka Center estimates BN would require 47.5 per cent of Malay support to win the 95 seats. "At this time, we estimate their support level at 53 per cent of the Malay vote," said Mr Ibrahim. "So right now they have a 5.5 percentage points surplus (of Malay support) nationwide," said Mr Ibrahim. "They (Barisan) still have the majority of the Malay vote," he said, adding that this was despite a fall in support in some states. Meanwhile the pollster says opposition pact Pakatan Harapan will need 100 seats in Peninsular Malaysia to win the election. They need to attain 34 per cent of support from Malay voters, assuming that their non-Malay support base does not change, he said. "Right now, they have 20 per cent of the Malay support. That is 14 percentage points (ppts) short of the 34 per cent target," said Mr Ibrahim. If Parti Islam Semalaysia (PAS), the third faction in the election battle, wants to be "king-maker" in the event neither BN nor PH gain a clear majority, Merdeka Centre estimates the Islamist party will need to win 20 seats in Peninsular Malaysia. "They are not counting on the non-Malay votes at all, they get only support from the Malay voters," said Mr Ibrahim. "We estimate that their support right now is 27 per cent of the Malay voters, and they need 39.5 per cent to cross the line. That's 12.5 percentage points short," he said. Mr Ibrahim said that despite the decline in overall support for BN compared to previous elections, the opposition still falls short of garnering the votes they need to win Malaysia's 14th election. "If the opposition cannot get the support they need, this could be fatal come election day," said Mr Ibrahim. He said that the split in opposition votes - between PH and PAS - may have prompted some undecided voters to go back to voting for BN. "BN will prevail despite a lower vote share," he concluded. The survey was conducted among 1,206 voters across all states of Peninsular Malaysia, Sabah and Sarawak through telephone interviews between April 3 and 9. Respondents were selected through random stratified sampling by ethnicity, age, gender and Parliamentary constituency.